Double check your vendor support when updating ESXi hosts from VMware vSphere 5.5 to 6.0. There are a lot of systems that are no longer supported. The following servers were supported in 5.5 but are according to the VMware HCL no longer supported in vSphere 6.0. Usually, the list gets smaller a couple of weeks after a new vSphere version has been released. I will update this post when I notice changes. Vendor support matrices and VMware HCL have some mismatches at the moment (HP and IBM). Servers are listed at the bottom. Please ask your vendor or VMware if you are allowed to upgrade. great post. are you planning to keep upgrading the post. Yes. I monitor HCL for changes regularly and update this post. As an interesting way of seeing how things progress, would you mind NOT deleting items from the list when the vendor adds support? Something interesting to me is some models that are listed are definitely supported by their OEM, but digging in it seems like the HCL published support is for Ivy Bridge (v2) but not Sandy Bridge (v1). So I wouldn't panic if you see a fairly new model that you use on the list. I expect a lot of those will disappear over time. I create this list more or less automatically, so it's not directly possible to to strike systems out. But I am going to do a diff on the changes to point out when servers appear in the HCL. I have checked this http://h17007.www1.hp.com/us/en/enterprise/servers/supportmatrix/vmware.aspx and there are some of the server from HP supported you mentioned as unsupported. I know as you wrote there is some differences between the VMware HCL and the HW Vender HCL. In this case always the HW Vendor HCL applies! LOL..you beat me too it. I find it amazing that Dell engineers know nothing about this patch, and really I want to know what's special about it? There is a custom ISO patch for the Dell R510 on the dell forums but even the Dell engineers will not acknowledge it exists, and they put it on there. I am going to be testing it here pretty soon on one of the two hosts. FYI - Just instal yesterday ESXI6 on two Dell PowerEdge R510. Did you use the customer ISO or the official one? Sorry I typed that wrong. Did you use the Dell custom iso or did you use the VMWare official iso for the R510? Lenovo ThinkServer TS440 (Intel Xeon E3-1245-v3) works even though not on the supported list. Also worth mentioning - no longer need to inject the net-e1000e-2.3.2.x86_64.vib. The ISO comes with newer driver. How is ESXi 6 coming along on that 2900? Any problems? Are you running just ESXi or vCenter as well? I have a 29000 III 2x Xeon 5410 that I would like to upgrade from 5.5, but have been worried as yours is the only post I have seen that states it has even been tried. I would also like to hear the answer to this! I have an old 2900 with lots of disk space that I'd like to load up with oddball, low-traffic VM's. I have tried installing on HPDL380G5 Xeon Processor and it had pink screened. I have tried on other FUj S6 Servers and so far its ok. I havent linked to the Prod yet just as the standalone for now. I've been running ESXi 6 on 3x PowerEdge 2900 servers with E5400 series Xeon CPUs for months. We have not identified any issues in ESXi and vCenter. We use several utilities to monitor and manage, and there has been no issue there as well. 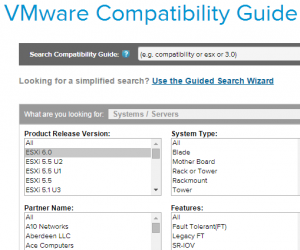 The E5400 is in the VMware Compatibility Guide, but the entire server is not listed. Dell support only lists up to ESXi 5.5, so we just used the Dell ESXi 6 image from newer servers. Thanks for the update Jason. I'll be upgrading to 6 when time permits based on this feedback. I've been using a Dell PowerEdge T410 (Xeon E5620, PERC H700) with ESXi 6 for a week or so, no issues so far. I'd really like this series make the list. It seems that IBM was doin' something. IBM Bladecenter HS23 (Intel Xeon E5-2600-v2 Series) appears to be supported now. Remove from unsupported list IBM System x3755 M3 (AMD Opteron 6200 Series) and IBM System x3755 M3 (AMD Opteron 6300 Series). cant believe the BL490c G7 still isnt supported. we have hundreds of them! And VMware HCL isn't up2date. Because DL360 Gen9 and DL380 Gen9 aren't listed at VMware, but HP and Partner supported at HPs list. however only on VMwares site and not HP's. confusing! and now they are no longer listed on VMware website. HP didn't believe me so i sent them the screenshots i took at the time. very frustrating! As an addendum to your list, we have two HP Proliant DL580 G4's (with the latest BIOS - P59) and, per the VMWare PSOD, our 70xx family CPU's (dual core, quad socket) are "unsupported" for ESXi v6.0. Looks like they are adding 6 to the Cisco UCSC-C220 servers as well now. It's always good to check back on the VMware HCL after a while. Before summer, our HP BL465c G7 was not listed as supported for ESXi 6.0, but now they are. Seems as it just took some time to take them thru the certification/support enablement process. Where you can view that HP ProLiant BL465c G7 (AMD Opteron 6200 Series) is supported on vSphere 6.0?? I don't found this information in the VMware Compatibility web. you removed IBM HS22 from unsupported, but I still can't find HS22 on HCL. Can you send me information about your source? Not sure what happend...some servers appeared on the HCL and are removed later. I'm going to create a new complete list. You can find HS22 under Lenovo and NOT under IBM. It has support for 6.0U2 and U3, but right now there is only a custom ISO from Lenovo with 6.0U2. I've completely updated the list. Now there are 177 Servers (up from 104). Please remember that servers from this list were supported in ESXi 5.5 U2 and are not supported in ESXi 6.0. Seems that we will need to renew all hardware for 6.0 ! Just upgraded a DELL PowerEdge 1950 (first gen) from 5.5 to 6.0. No problems. I saw on a comment that ML350 G5 works... Do you know about ML350 G6? I am planning to buy one for lab and I would like to know if the installation completes and works properly..
HP DL360 G5 works. Just use Vmware iso image (not HP), then add HP offline bundle drivers prior to 2014. No issues in two months lab setup. Hi, I own Supermicro with X5650 which is unsupported by 6.0. On bare metal host it simply doesn't dectect my onboard NICs, I cannot manage ESXi 6.0 hosts. However, I did simple trick - upgrade from 5.5 to 6.0 via command-line (see official Guide at https://kb.vmware.com/kb/2109711, esxcli) and it works as expected.. No missing drivers..
Hi, please can anyone tell me, if it is possible to run ESXi 6 on a DELL PowerEdge 2950-III (Intel Xeon 54xx Series)? Especialy with the build in drivers for the Raid-Controller DELL PERC 6/i. DELL PowerEdge 2950-III was supported in 5.5u3, which uses the same drivers as ESXi6. It's not supported, but it should work. Hello guys great job, I would like to ask you about, I would buy an HP ProLiant DL360 G6 with 72 gb memory to install windows with vmware workstation, then install 4 esxi 5.5 or 6.0 to create a host NSX laboratory for expert examination. Do you think it possible? Thanks for your prompt response, I have already taken the VCP6-NV certification and now I'm studying for the expert VCIX-NV. Laboratories (http://labs.hol.vmware.com/) are very useful, but I can't do some things with the VPN ssl and update end installation. So at a cost of around € 250 I had thought about buying DL360 with 72GB Memory install vmware workstation 12 to create 3 or 4 esxi ans connect them with the network router for build one lab. Why not installing ESXi on the DL360 and run nested ESXi there? Running VMs on Nested ESXi hosts works a little bit better then running everything in VMware Workstation. Nested ESXi on the Free ESXi works great. technically, both solutions should work. You thanks for the advice, as I understand it you're telling me to install the software on HP servers esxi then inside the install a vm with windows where I install workstation then inside workstation install 4 esxi host? Pardon me but if you already install the HP esxi how do I install other four? 4 ESXi as Virtual Machines on the ESXi that is running on the HP. But how can to runs as VM if there is just one esxi? Connect to the host directly as root using there vSphere client (or host client via web if on 6.0 U2) then create the shell of a VM. load another ESXi instance nested inside (great for labs). enjoy! Now saw, that the T420 is not in the Tower category at their Site, but it is there when you select "All systems". So it is officially supported. PowerEdge R710 E5520 not supported..ESXi 5.5-6.7. Bummer!! What about HP StorageWorks EVA array? Is it support by VMware ESXi 6.x?